The period initially covered by Arts:Search is 1903. Available soon. Little is known about this magazine. 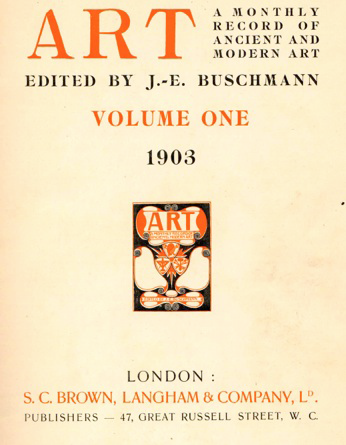 It was edited and printed by J.-E. Buschmann in Antwerp, Belgium, and may have been a short-lived English language edition of the Belgian art journal Onze Kunst (1902-1929) which was also printed by Buschmann. There is a definite bias in ART towards Flemish and Dutch art with articles on Constantin Meunier, Rubens, contemporary Dutch applied art, the drawings of the Flemish masters, Dirk Nijland, Hugo van der Goes, H.P. Berlage, France Courtens, etc. Also contains a monthly round-up of mainly Belgian and Dutch art news.